Editor’s note: The 2018 International Bodyshop Industry Symposium Global Summit wrapped up Wednesday in Munich, Germany. As we were unable to jet-set it over to Europe, IBIS organizer and reporter bodyshop magazine was gracious enough to allow us to reprint some of their coverage. 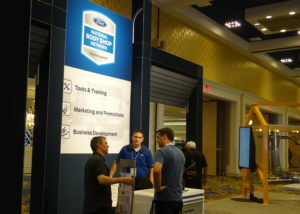 One of the most interesting Munich speakers was Ford aftersales marketing and global collision repair director Jennifer Boyer, who spoke to the OEM’s desire to be involved in the auto body repair process. Here’s an abridged excerpt from bodyshop/IBIS’ coverage. Get even more information by reading the entire June 12 article here. Further to this, Jennifer then highlighted the results of a Ford customer survey which asked what was most important to them when choosing a bodyshop. The results showed 52% wanted a vehicle manufacturer approved facility; 21% desired a family or friend recommendation; 20% an insurer recommendation; and seven per cent were keen on something geographically convenient. Jennifer then explained the Ford collision philosophy which is ‘to provide Ford owners with quality collision repairs utilising Ford OE repair procedures and parts.’ The philosophy takes into account five strategic pillars: prepare; develop; engage; provide; and grow. Read the complete June 12 article on the IBIS website here.